William Morrow Paperbacks, 9780062005946, 400pp. It is an undeniable truth: Parents Need to Eat Too! Food and parenting writer Debbie Koenig addresses the dilemma faced by so many parents coping with the demands of a new baby by offering simple, healthy, and delicious recipes for moms and dads who are too sleep-deprived, too frazzled, or simply too busy to cook nutritious meals for themselves. From dinners that can be eaten with one hand (while you hold baby in the other) to slow cooker culinary masterpieces and full courses to prepare while baby naps, Parents Need to Eat Too is filled with tasty, easy-to-make recipes, helpful kitchen tips, and real solutions to the problems faced by hungry parents. 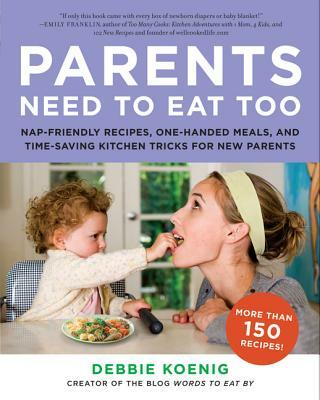 Parents Need to Eat Too has been named one of the Best Cookbooks of 2012 by Leite’s Culinaria, whose Editor-in-Chief Renee Schettler Rossi called it the “What to Expect After You’re Expecting” and said that the book “savvily and sassily helps you extend the efficiency of any time spent in the kitchen.” A must-read for new parents! Debbie Koenig is a food writer whose work has appeared in American Baby, Parents, the Washington Post, the New York Times, and other publications. Her food blog, Words to Eat By, has attracted more than one million visitors. Debbie lives in Brooklyn with her husband and their five-year-old son, Harry. With more than 150 recipes, intelligent healthy tips, and comments from real moms just like you, Parents Need to Eat Too will be your go-to resource and make you the confident parent you want to be.